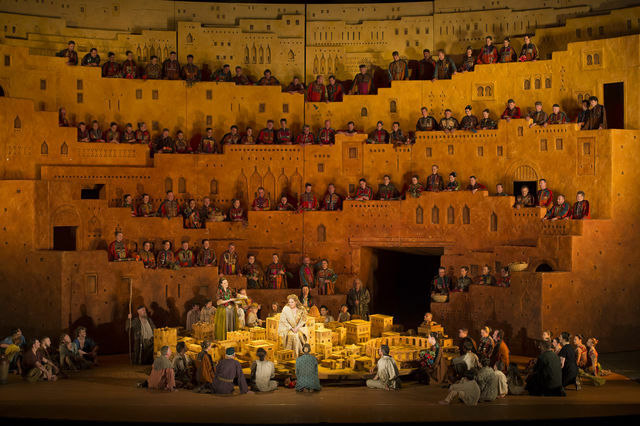 Les Troyens is a wonderful, unique, and rare opera (also REALLY BIG), but it’s not one that sells itself. Without an equally strong and unique cast and production–from each of the principals to the chorus and choreography–its five and a half hours can become a bit of a slog. While there are some considerable virtues in the Met’s current revival, it’s only an intermittently satisfying affair. Francesca Zambello’s production is fairly traditional, with a few Virgilian Easter eggs and non sequitur insertions that pass for vision. Maria Bjørnson’s multi-level George Tsypin-esque set is neither particularly effective nor intrusive, though its textured strips of metal make it resemble a high-end corporate lobby. (The sight lines are bad, too. In Act 2 I couldn’t see the ghost of Hector at all.) The costumes are traditional colorful robes and armor in the Troy portion and in the Carthage half consist of lots of all-white robes and royal purple. Zambello tends towards the heavy-handed and cluttered. Some plot points are underlined and circled, such as Ascagne taking Dido’s ring and Andromache’s screaming, while other developments seem quite badly timed, such as Dido and Aeneas finding love at the beginning of the Hunt kind of robs the rest of the act of its point. 1. The Carthaginians don’t have chairs. They lounge on cushions. 2. The Carthaginians always look like the members of a New Age cult. White robes, little in the way of gender differentiation (apparently a side effect of having a queen?). 3. The dancing is usually awful, and goes on for far too long. 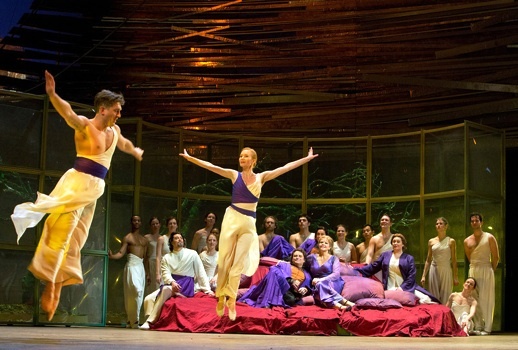 I actually liked Doug Varone’s choreography of the Chasse royal a lot, where he has a chance to build the drama to some developmental music, and wished Dido and Aeneas hadn’t been providing visual distraction as well as premature macking. But the insertion of dance at other points, such as Iopas’s song and the jazz hand-filled Laocöon ensemble, is irritating, and the long dance sections of Acts 3 and 4 outstay their welcome. Overall, at least as revived here it’s a generic, uninspired production–in Carthage considerably less egregious than David McVicar’s recent effort but also far less visually arresting in Troy. I must say that this production’s moderately-sized, literal horse is far less impressive than both McVicar’s steampunk fire-snorter and the Pountney production’s take, where giant feet kicked at the Trojans from overhead. The problem with a lackluster Troyens is that you become acutely aware of how uneven the piece is. It’s not that much of it’s bad (I think it’s 98% genius, and the 2% is mostly the Dance of the Nubian Slave Girls), but it doesn’t fit together without consistent energy and vision. In this performance, I was not convinced that we really needed two peripheral beatific tenor arias, plus, well, I adore the whiny soldiers in Act 5. They’re my second favorite whiny soldier duo in opera, beat only by Nero’s guard in Poppea. 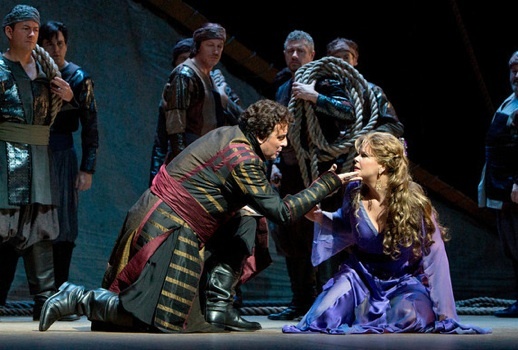 The glance into their lives, plus the respite of Hylas’s music, are what gives the opera its epic quality. But if they don’t have some spirit you just want to get on with it. The best thing about Fabio Luisi’s conducting is that it kept everything moving. I liked his work in the quieter music best, such as the lovely Didon-Anna duets, where he found a nice gentle flow. And the processions and choruses had a good solid momentum, with only a few coordination issues early on. 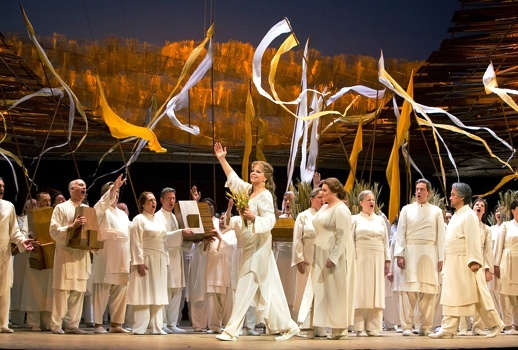 The chorus, by the way, might be the real star of Les Troyens, and while I found the Met chorus somewhat less impressive than the ROH’s last summer, it was still a strong showing. Where I thought Luisi was less satisfying was in the quirky stuff that makes Berlioz so special, stuff like the ostinatos, the irregular phrases, the sudden turns. Stuff like this moment. Luisi has a tendency to make it all sound like early Beethoven, and pleasantly bland early Beethoven at that. More lurching energy, more neuroticism was needed. Besides the chorus, Susan Graham is the star of this production. Her Didon is absolutely beautifully sung and acted, with more depth and intensity than I remember in her performance on the Châtelet DVD. She expertly balances musical grace with the text, giving her Didon dignity and stature, convincingly regal but also human. Her voice is bright but also slightly grainy, a perfect size for this role and by the end she becomes a real tragedienne at the end. Her only issue is high notes: the big and prominent B flat in “Chers Tyriens” simply entirely failed to come out both times, leading to a somewhat anticlimactic end. I’m guessing there isn’t a lot of time with Octavian in her future (which is a shame, because she is otherwise outstanding there!). I wonder if Marcello Giordani took the widespread rumors of his imminent replacement personally. (How could you not?) For the first three acts he seemed to be giving it his all, and managed a little better than I expected. His voice is aging, the high notes extraordinarily loud but not very pretty, the disconnected lower range hollow-sounding and weak. It was in Act 4 where the problems really began to show, with a can belto “Nuit d’ivresse” that completely drowned out Graham’s more appropriately nuanced efforts, and his Act 5 “Inutiles regrets” were indeed regrettable, involving something resembling a high C and some B flats but also a lot of vaguely rhythmic, somewhat pitched shouting towards the end. His acting is acceptable but not exactly dashing or charismatic. I would not at all be surprised if he were sent packing to, uh, Italie before the HD broadcast (“he’s not Italian! he’s Sicilian!” -my relatives, my family comes from southern Italy). The rumored replacement is Bryan Hymel, who, with indisputable competence if not terribly much beauty, sang the role earlier in London this year. 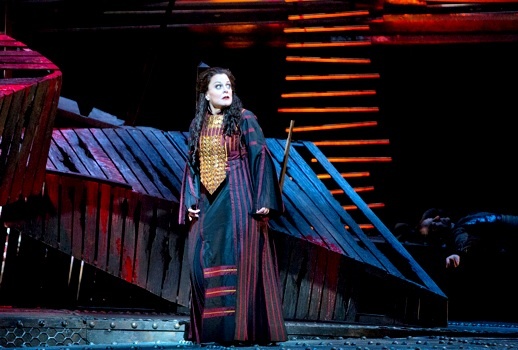 Deborah Voigt’s wan, poorly sung Cassandre made me long for London’s brilliant Anna Caterina Antonacci. Voigt was always a Chrysothemis, someone who plants themselves in front of the conductor and makes a glorious sound. Cassandre is a role that requires the charisma and madness of a mystic, which Voigt has never possessed. What’s more, the sound is gone, the voice small and sour, a shadow of her past. She vocalizes through the music with rather unpleasant tone and unclear French, rarely looking at her Coroebus. Very disappointing. The army of supporting cast was strong, for the most part. Karen Cargill’s warm, rich low mezzo as Anna was a highlight, and she made an excellent contrast to Graham. Paul Appleby sang Hylas with a sweet tenor and honest, simple phrasing. In contrast Eric Cutler was a Iopas with a large but uneven voice and fussy phrasing (with a fussy staging from Zambello), somewhat miscast and unaware that less is sometimes more. Julie Boulianne sounded clear as Ascagne with some strange flirty direction. Stephen Gaertner stood in for Dwayne Croft as Chorèbe and showed a strong, full dark baritone. The two most prominent basses, Kwangchoul Youn (long time, no see!) as Narbal and Richard Bernstein as Panthée, were both excellent. There’s great stuff in this production, but it requires patient waiting through considerable quantities of not so great stuff to get to all of it. Still, recommended under the general “come on, it’s Troyens” rule. 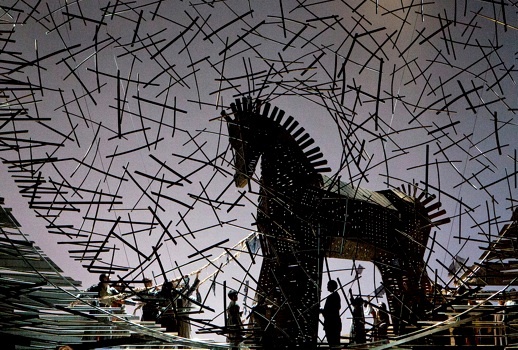 Les Troyens continues through December with an HD broadcast on January 5. McVicar's production is coming to SF in a couple of years, with Graham and Antonacci. We're more likely to have Brandon Jovanovich or Brian Hymel than Giordani, thank goodness. Or, who knows, JH Morris? Troyens is new to me, and last Monday's performance made me think I was watching an elephant dance. Your review, in retrospect, points out why. I was close to leaving at the first intermission with the thought that it was taking Berlioz 20 minutes to say what anyone else could say in seven, but perhaps it was as your suggest Ms. Voigt's delivery that made it seem so boring. I think there's a difference between grandiosity and bombast in opera and while your insightful review suggests the no-man's land in between, it's not a show I'd pay to see again. Enjoyed your review – thank you. Listening LIVE via WQXR-FM NY, Acts 3, 4 and will miss the choreography this time, but will listen for the soldiers. Saw Ms. Graham in Poppea, LA Opera. Enjoy her performances very much- especially those in French. Merci.